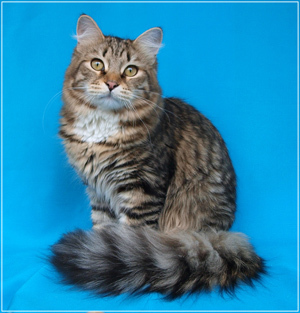 Siberian cat: description of the breed and the exterior. 1. Siberian cat - one of the most common breeds in the territory of the Russian Federation. A long, thick wool that does not allow moisture, a large muscular body, broad paws and a fluffy tail are the distinguishing features of representatives Siberian breed. She has an independent character and features inherent in this predator, but the adoration of her masters and the amazing affection are her best qualities. It is for certain unknown when exactly representatives of this breed appeared. It is known only that the cat was originally called "Bukhara" and was widespread in the west of Russia, and then, after hitting the Urals, it began to acquire a different appearance. The wool of these animals gradually became thicker, longer and denser. In addition, a warm undercoat appeared. As a result of natural selection with wild Siberian cats, a fundamentally new breed - a Siberian cat, in which literally merged the stern east and the elegant west. Exterior and features of the structure of the body. 1. The body length is close to the average. It is well muscled and strong enough. 2. The abdomen is barrel-shaped, elastic, and the shoulders are just below the back. 3. The limbs are of medium length, and the hind legs clearly over the length dominate the forelegs. 4. The paws are large, round in shape, with the edge between the fingers. 5. The tail is wide at the base, with a further tendency to narrow. 3. The head is large and trapezoid in shape with rounded contours. Muzzle slightly rounded, ears large, also slightly rounded and slightly pushed forward. In the upper part of their ears are more fluffy, that steadily leads to the formation of brushes that make the "Siberian" look like a lynx. On the photo: Siberian kitten from nursery "The Tale of Siberia" The eyes are large and round and can have very different colors, and their outer corner is slightly skewed towards the ear. The distance between the eyes is quite large, but not critical. The neck is strong. The chin is slightly rounded, but does not protrude and completely coincides with the nose. Muzzle of medium length, and on the line of the nose, you can see a depression. Cultivation of Siberian cats in nurseries. 4. For the first time, information on the phenotype of the Siberian breed was placed in the register of the Sozovsk Felinological Federation in 1990. During the next 5-7 years the Siberian breed was recognized by the world's leading felinological organizations. Within 10-15 years, the number of nurseries in the territory of the Russian Federation and near abroad, engaged in professional breeding work with Siberian breeds, has increased to 400. Constantly there are new felinological clubs and communities of Siberian lover.